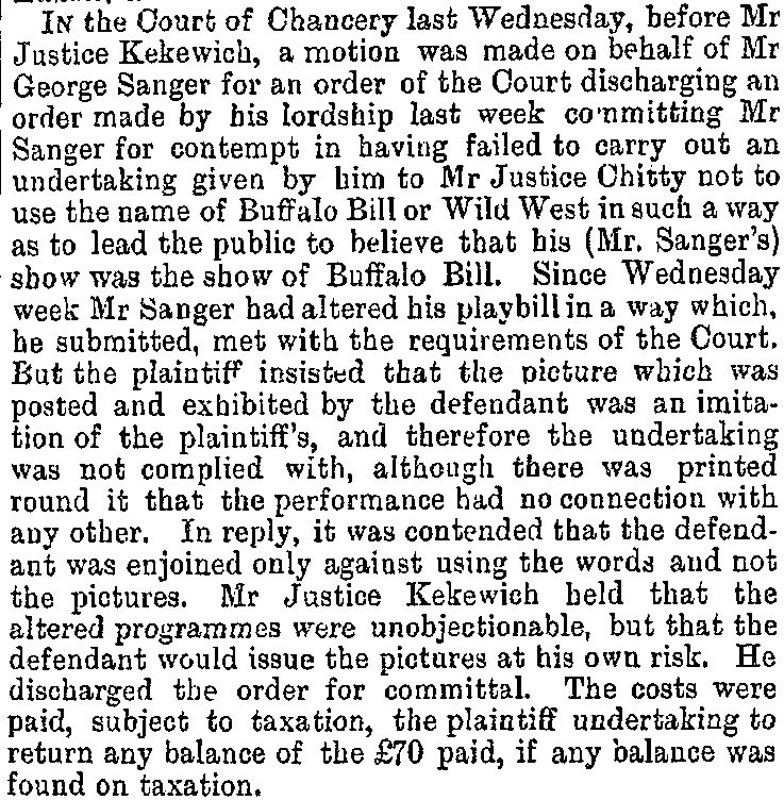 In the Court of Chancery last Wednesday, before Mr Justice Kekewich, a motion was made on behalf of Mr George Sanger for an order of the Court discharging an order made by his lordship last week committing Mr Sanger for contempt in having failed to carry out an undertaking given by him to Mr Justice Chitty not to use the name of Buffalo Bill or Wild West in such a way as to lead the public to believe that his (Mr. Sanger's) show was the show of Buffalo Bill. 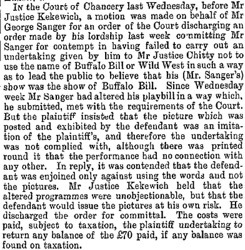 Since Wednesday week Mr Sanger had altered his playbill in a way which, he submitted, met with the requirements of the Court. But the plaintiff insisted that the picture which was posted and exhibited by the defendant was an imitation of the plaintiff's, and therefore the undertaking was not complied with, although there was printed round it that the performance had no connection with any other. In reply, it was contended that the defendant was enjoined only against using the words and not the pictures. Mr Justice Kekewich held that the altered programmes were unobjectionable, but that the defendant would issue the pictures at his own risk. He discharged the order for committal. The costs were paid, subject to taxation, the plaintiff undertaking to return any balance of the £70 paid, if any balance was found on taxation.